Reyneil is a proud veteran, who served in the U.S. Navy for four years. He received many accolades and awards for his exemplary service and dedication. After serving our Country, Reyneil went on to further his education using his GI Bill educational benefits to improve his life and redefine his vocation and future path. Reyneil’s life is centered on his children, and when he talks about them, his pride and devotion are apparent. His 13-year old daughter, Jordan, is a very involved 8th grade student, who serves on the ASB (associated student body). She also plays softball and volleyball, enjoys cheerleading and dreams of attending UCLA one day. Jordan says her Dad is her best friend and biggest supporter. The younger children, 6 year-old Malachi, and 4 year-old Daisy, live with him half of the time. Malachi, who is in first grade, likes to play football, soccer and basketball as well as practice his karate. Daisy’s most favorite hobby is ballet. Reyneil looks forward to each athletic event and performance. The family currently lives in a small one-bedroom apartment in Imperial Beach. Working with limited space, Reyneil has given the bedroom to his children. Outside safety and play area has also been a concern, since their apartment is located on a busy street. Reyneil values his children above all else and longs to provide them with more space, safety and stability, so that they can grow and thrive. He talks about what a big change his new home will be for them all, bringing security and the enjoyment of coming home to their own spaces. Living in a one-bedroom apartment has been challenging. Reyneil places the highest priority on his family and their time together. When describing their dynamic and special relationships, he says they are a fun, loving, caring and exciting family that has so many great personalities and interests. In particular, they enjoy going to the beach, park, movies and skateboarding, with attending Comic-Con as the highlight each year. 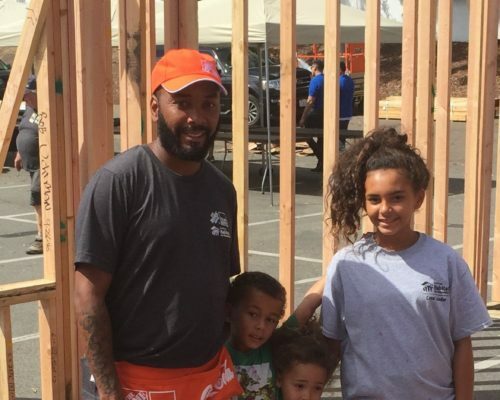 Reyneil is excited and proud to have the opportunity to help build his own home with Habitat for Humanity. He is very hands-on and sees his partnership with Habitat as a tremendous opportunity to learn and participate in his future. Homeownership is going to provide Reyneil and his children with peace, security and self-reliance. As he talks about his Habitat for Humanity experience, Reyneil uses the word “AMAZING” to describe it all. He feels a great sense of peace and excitement for his family’s future in their new home.